Why Do Some Credit Cards Carry an Annual Fee? Be honest: You think it’s outrageous that anyone would sign up for a credit card that charges an annual fee. After all, there are so many great cards on the market that carry no annual fee. What’s the point of paying up every year if you don’t have to? But annual fees are assessed for a reason. In some cases, it might make sense to opt for a card that charges one. Ready to learn more? Let’s dig in. The primary reason some credit cards charge an annual fee is that they aim to offer big rewards to a certain type of user. Here’s the scoop: Credit card issuers try to attract customers who spend a lot on their plastic because they will generate serious revenue for the company. To do so, they offer cards with stellar rewards, but they can’t do this for free and still remain profitable. Luckily, most big spenders recognize paying an annual fee as worthwhile, because they’ll earn enough in rewards to outweigh it. The higher rewards you’ll earn with a card that charges an annual fee usually come from two sources: The rewards rate you’ll get on your spending and the card’s signup bonus. Nerd note: When it comes to sign-up bonuses, it’s important to remember that they’re usually not granted simply for opening a new account. You’ll probably have to open a new account and meet a minimum spending requirement within a few months to get the bonus. Be sure to pay careful attention to this as you’re comparing different cards. Besides rewards, another reason a credit card might charge an annual fee is that it offers other high-value perks. For instance, with the United℠ Explorer Card, you’ll earn 2 miles per $1 spent at restaurants, on hotel stays and on purchases from United and 1 mile per dollar on all other purchases. The card provides a good sign-up bonus: Limited time offer! Earn up to 60,000 Bonus Miles. It has an annual fee of $0 for the first year, then $95. However, when you pay for a flight with the United℠ Explorer Card, the first checked bag is free for you and a companion on your reservation. With just one roundtrip per year per couple, the card has paid for the annual fee. Is paying an annual fee right for you? Hopefully by now you’re convinced that it’s not ridiculous to get a credit card with an annual fee. But that doesn’t mean you necessarily should — it depends on your lifestyle and spending habits. 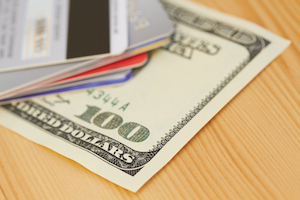 One factor to consider is how much you charge to your credit card on a yearly basis. Every card is different, so you’ll have to do the math to figure out if you spend enough to make paying an annual fee worthwhile. Remember to base your calculations on both what you’ll earn in rewards on spending and the card’s signup bonus. Also consider the value you’ll get from other perks offered by the card, such as the free checked bag feature in the example above. Be sure to think carefully about whether or not you’ll actually use the rewards the fee-based card is offering. Many of these cards are designed for travelers — if that’s not you, there’s nothing wrong with getting a cash-back card with no annual fee and a high rewards rate. No matter what you decide, be sure to check back in with the Nerds as often as you can — we’re always here to help find the card that fits you best!